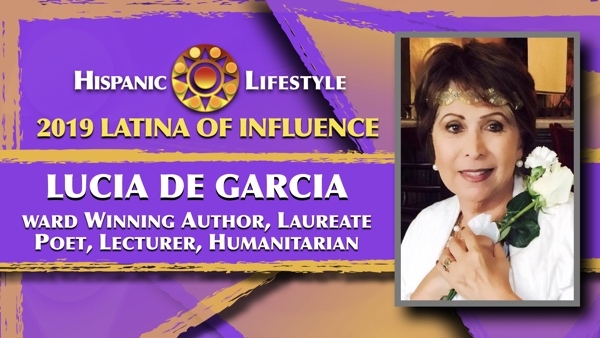 Hispanic Lifestyle is pleased to recognize Lucia De Garcia Laureate poet and writer, social innovator as a 2019 Latina of Influence. Ms. De Garcia along with our entire list of 2019 Latinas of Influence are invited to participate in Latina Conference 2019 taking place April 10 and 11, 2019 in Ontario, California. She is the author of the books “Building Bridges of Understanding – My Personal Quest for Unity and Peace” and the Spanish version “Creando Puentes de Comprension – Mi Conquista por la Unidad y la Paz”. “Lucia De Garcia – A Peaceful Light – My Odyssey to the Center of the Heart” and the Spanish version “Lucia De Garcia, Una Luz de Paz – Mi Odisea al Centro del Corazón”.